Here is a collection of articles that will help you understand and better explore things to do in Guilin. Being the largest and most famous park in Guilin, it features karst hills, rivers, caves and a tranquil lake. The Seven-Star Cave (Xi Xia Cave) provides visitors with some amazing underground scenery. The million-year-old cave was originally part of an underground river. For hundreds of years, local people believed that the cave was the residence of immortals. The park has scenic spots like Camel Hill, Seven Star Cave, and Follower Bridge. This is a wonderful area to walk around, relax, and really enjoy the clean, pollution-free air of Guilin, China, which is somewhat unique in a country that is known for its smog. Climb to the Pagoda at the top of the hill for unrivalled views over the lakes and river, and the nearby Guilin hotels. Pagoda Hill is located in the southern section of Guilin on the west bank of Li River. It is directly opposite Tunnel Hill. A hexagonal pagoda called Longevity Buddha Pagoda was built atop this hill in the Ming Dynasty (1368-1644). The second level of the pagoda has a shrine to the Longevity Buddha – Amidabha on display. Guilin is a city built around the Lijiang River, or Li River for short. River cruises are one of the most popular tourist attractions in the city. Guilin hotels can arrange luxury cruises to nearby Yangshuo. It’s best to go in spring or autumn when the Guilin weather is at its best. Discount tickets are available from Yangshuo Mountain Retreat. Guilin weather is generally very calm and mild, although for those visiting in the summer, some rainy day activities may need to be added to the sightseeing itinerary. Guilin weather is wettest during the months of May and June, with around 350mm falling during each of these months. When the Guilin weather isn’t at its best, take cover in one of the city’s fascinating museums. This museum is one of the most visited tourist attractions in Guilin, China. 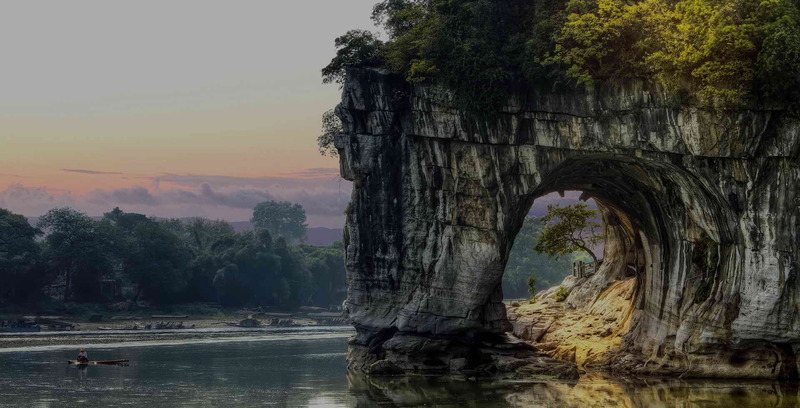 It showcases the best of the native talents of the region, and demonstrates just how diverse Guilin, Guangxi, China really is. There are live performances to watch, and handcrafted souvenirs to purchase. This museum is the largest in the Guilin, Guangxi, China region, and is one of the best places to spend the day when the Guilin weather isn’t so good. Much of the artwork is native to Guilin, China, and there are opportunities to purchase paintings from local artists. Guilin flights depart from Hong Kong, Malaysia, Japan, and South Korea. Guilin flights land at Guilin Liangjiang International Airport, located in the Guilin Guangxi, China region, but approximately 18 miles from the area that is considered to be the true Guilin, China. Although there are a few activities near to the Guilin China Liangjiang Airport, such as the Xiongsen Bear and Tiger Village, most visitors do stay in Guilin hotels located in the city centre. Taxis and shuttle buses are available from the airport into Guilin, China, and the journey takes roughly 30 minutes. Yangshuo Railway Station opened in 2016 and introduced high speed rail service linking Guangzhou South Station in Guangdong and Yangshuo in Guangxi Province, making it possible to travel between Guangzhou and Yangshuo by high speed trains directly. As of May 2017, there are 10 daily high speed trains from Guangzhou South to Yangshuo and vice versa. This travel route is quite popular, and the train tickets often sell out quickly. Departing from Shenzhen for Yangshuo: Take a high speed train from Futian Railway Station or Shenzhen North Railway Station to Guangzhou South first, then a connecting train to Yangshuo. (See Shenzhen to Guangzhou Train). Starting from December 28 of 2017, direct high speed train service between Shenzhen and Yangshuo has been launched. Departing from Hong Kong to Yangshuo: You can enter Shenzhen via Lowu Port or Futian Port by metro, then take a high speed train from Shenzhen (Futian Train Station or Shenzhen North) to Guangzhou South, then a connecting fast train to Yangshuo. As Guilin, China, is primarily a tourism-based city, there are hundreds of hotels located in the region, many of which are operated by well known Western brands, such as Sheraton. Guilin hotels range from inexpensive hostels, like the Guilin Riverside Hostel, to luxurious 5* accommodations such as the Shangri-la, so there are options to suit all budgets. As a general rule, Guilin hotels overlooking the Lijiang River, Shanhu Lake, or Ronghu Lake will be more costly due to the prime location and spectacular views.